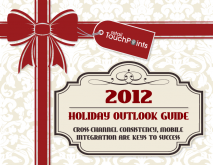 Retail TouchPoints (RTP), the industry’s go-to source for customer engagement strategies, has released the 2012 Holiday Outlook Guide, an insider look at how smart retailers are preparing for the upcoming holiday. “The buzzwords for the holidays are similar to what retailers are hearing year-round in today’s marketplace: customer service, cloud, cross-channel, social and mobile, said Debbie Hauss, Editor-in-Chief of Retail TouchPoints. The holidays may be months away, but smart retailers are strategizing today, according to Retail TouchPoints (RTP), the industry’s go-to source for customer engagement strategies, in the 2012 Holiday Outlook Guide released on June 26.
revolution. Impressive results from last year’s holiday season are motivating retailers to strengthen their mobile strategies in 2012. On Christmas Day 2011, for example, consumers increased mobile shopping by 173% over the previous year, according to the study titled: Google Post Holiday 2011 Takeaways. Additionally, 12% of online visits to a retailer’s web site came from a mobile device during the 2011 holidays, a 5% year-over-year increase. HauteLook’s 2011 holiday success hinged on multiple strategies across channels to boost basket size and optimize loyalty initiatives. Greg Bettinelli, CMO for HauteLook, shared further insight on the must-haves for this holiday season and beyond, as well as some best practices for e-Commerce, mobile and more. His recommendations are: 1) Keep it simple; 2) Develop consistent branding; 3) Mobilize, mobilize, mobilize; and 4) Stabilize the site. The fast-moving social media environment also will take retailers for a ride during the holidays. “Given how quickly social media has been adopted, how many channels are popping up, seemingly daily, we believe the opportunities for retailers will increase this year, along with the competition for consumers’ attention,” noted Michelle Crames, Founder and CEO, SkuLoop. There’s much more in the full report. For a complete view, please click here, or contact Debbie Hauss, Debbie@retailtouchpoints.com, for interview opportunities.